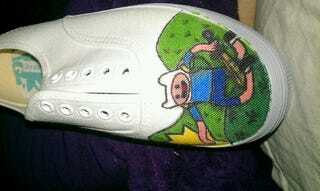 I'm making Adventure Time shoes! Sharpie is bleedier than I thought, but I think it looks pretty ok! I have a lot of shoe to go. I also got a second pair for Fionna and Cake. Sorry for the sideways picture.